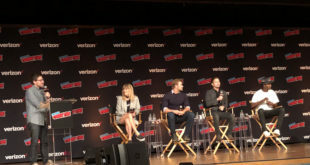 Shadowhunters rocked New York City Comic Con once again bringing main stars Dominic Sherwood, Katherine McNamara, Matthew Daddario, Emeraude Toubia, Alberto Rosende, Harry Shum Jr., and Isaiah Mustafa along with new showrunners Todd Slavkin and Darren Swimmer as well as author Cassadra Clare. The series is based on the book series The Mortal Instruments (written by Clare) that follows the journey of Clary Fray, an artist who discovers she’s half angel and must now navigate a world where vampires, werewolves, and demons exist. The Workprint caught up with Katherine McNamara (Clary Fray) and Emeraude Toubia (Isabelle Lightwood) on their characters’ growth as well as a grittier and action-packed season 2 of Shadowhunters at New York Comic Con. Clary’s entire world has been revolving around finding her mom so what happens now? Katherine McNamara: What happens now is that Clary has to confront the fact that her mother lied to her for 18 years and that the relationship of trust and respect that she thought she had with her mother is all a lie. And so she has to deal with that betrayal on top of the fact that her mother still sees her as a little girl, her mother still sees her as this mundane that was sheltered. Clary’s out of that life now she’s a shadowhunter, she’s developing into this warrior and getting her mother to see that, getting her mother to see her growth and maturity is a huge challenge. It’s a huge challenge for her this season But you know she has someone else to lean on that also has issues with her mother. Emeraude Toubia: But not for long! McNamara: That’s true we do fight! We fight this season more than just physically. Toubia: Yea so that’s going to be exciting. Well that’s great cuz I feel like Isabelle all of last season was focusing on other people, so in this season does she get to stand up for herself? Toubia: She gets a lot of like solo stuff. McNamara: She does something for herself I’ll tell you that much! Toubia: Yea she goes down a dark path this time around. She’s starting to, it’s the same character but she’s in different places so the circumstances make her act differently. So it’s going to be exciting, it’s going to be dark, it’s going to be mature. McNamara: That’s whats so great about this season it’s darker, it’s grittier. We do have a sense of maturity and we are straying very far from the books, which is exciting because it allows us to take these characters, I mean we still stay with the tone and the spirit of the books and what they mean to people and the characters stay very true to themselves. But it allows us to throw these characters in situations that they wouldn’t have otherwise been in and it forces them out of their comfort zone and it forces them to make very difficult choices. See this sneak peak at Clary and Isabelle’s training session that was released to panel attendees at NYCC. In addition, watch the first trailer to season 2, coming on Freeform January 2, 2017. GLOW Season 2 offers up a bit of dark humor, budding romances, a gross amount of fun, and above all else, a whole lot of entertainment.